I'd like to start this post with a little "review" of sorts. Please know that I have never received anything from this store for reviewing it, I'm just a happy patron! There is no place in the world I love more than a good bookstore. I frequent an awesome bookstore near me called Book Revue. They have an amazing children's section where they feature different authors, including Jan Brett. If anyone is a local Long Islander (NY) I would highly recommend visiting and grabbing some budget-friendly, gently used books. A lot of the copies I buy are often just $4.50 and in great shape. ANYWHO I like promoting local businesses, especially awesome ones. Plus, I bought my Jan Brett books here so it was fitting! I'm always taking suggestions from followers! I think you guys have the best input because you're out in the trenches everyday in different environments working your SLP voodoo! When a follower suggested a book activity packet for "The Hat" by Jan Brett I jumped at the opportunity! I love Jan Brett! 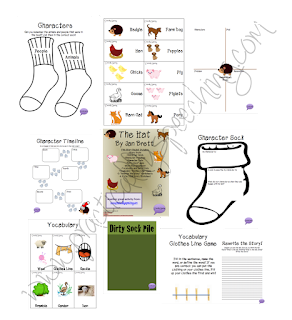 I recently did an activity for his "The Three Snow Bears" (find it HERE) that was a hit! I think children's literature is the best. It's fun, it's full of meaningful lessons, and the illustrations are always great. -Vocabulary "Clothes Line" game involving Sentence Fill-ins, Definitions, and Word Match. You have zillions of lessons in here, zillions! LOL Please leave some feedback and let me know what you think! With the crazy weather here in NY (see house pic nightmare of snow!) I wanted to share my adapted free book for winter clothing! This will be one of those short, late-night posts, so I apologize! I wanted to make sure this one got out to you guys! I created this for use with an AAC device, but it really can be utilized for so much more! I've also used this activity to target vocabulary with an ESL student, following directions with a student targeting auditory comprehension, and as an introduction to the topic of winter! The options are endless! Plus, I wanted to make this a freebie since I know I have been using tons of awesome freebies on TpT from fellow bloggers - gotta give back! 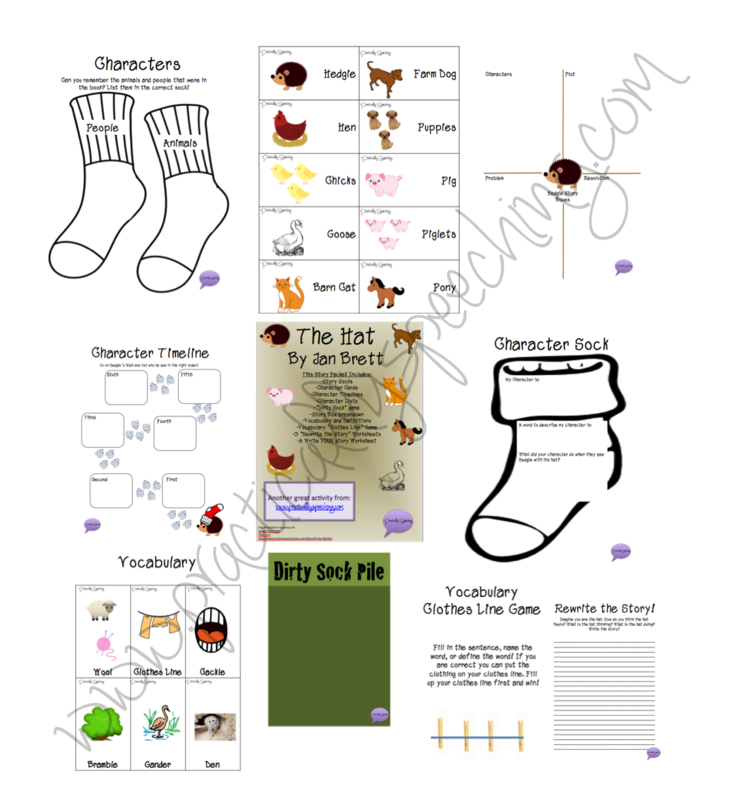 Click HERE to download this freebie adapted book on TpT! FREE Parent Handout for "Self-Talk" and "Parallel Talk"! This summer I pledged that I would work with more of the little little guys in my private practice - early intervention and preschool age. I love this age group and really missed working with them (currently I see preK through second grade in a school setting). Working in a home-based environment is incredible because of all of the great parent-training we get to do. I love being able to explain and show exactly what I'm doing and the strategies I'm using. As all SLPs know, with this age group we are doing a lot of self and parallel talk. Sometimes I leave my half-hour sessions out of breath! Of course, talking is never an issue for an SLP!! I find that my parents are talking to their child, however their language needs to be modified, or they need to present things differently (i.e., giving options to elicit more language vs. yes/no questions). Just a quick check-in before I wander off into Sunday chili and sweatpants! I wanted to share this following directions packet I've been using for the month of October. I have a lot of kinders this year who came in with following directions goals. I've been trying to target them each session with fun, coloring crafts each time so they can see their work. This packet is four pages, black and white, and FREE! It includes following 1 and 2 step directions, following varied directions, and following conditional directions. All the sheets are halloween themed and of course black and white for low-ink usage! Check out this scarily fun packet HERE on TpT!